Renowned conductor and UC Santa Cruz alumnus Kent Nagano received a Grammy Award for “Best Opera Recording: "Saariaho: L'Amour De Loin” at the 53rd Grammy Awards, held at the Staples Center in Los Angeles. The recording with the Deutsches Symphonie-Orchester Berlin and the Rundfunkchor Berlin features singers Ekaterina Lekhina, Marie-Ange Todorovitch, and Daniel Belcher. Nagano graduated with degrees in music and sociology from UCSC in 1974. This is his third Grammy Award. An internationally acclaimed opera and symphony conductor, he has worked with most of the world's finest orchestras including the Vienna, Berlin, and New York Philharmonic Orchestras. "When I began my relationship with UCSC in 1969, the university was just starting out,” said Nagano. “UCSC's unique structure placed exceptional scholars in close working relationships with students, which meant that one could find so many inspirational mentors. The faculty were the most qualified and brilliant you could find anywhere." 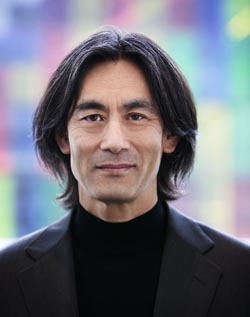 Nagano is currently music director of both the Bayerische Staatsoper and Orchestre Symphonique de Montréal. He has recorded widely, receiving prizes from Grammophone, Grand Prix du Disque, Edison, and Musical America, in addition to his Grammy Awards.